Beneteau GT46 is one of the leaders when it comes to the latest sport cruisers out there. Its bold and stylish exterior differentiates it from other yachts of its caliber. The interior of this GT 46 is designed as creatively as the exterior. It offers two or three cabin layouts. The interior is very well ventilated and offers a good amount of natural light. 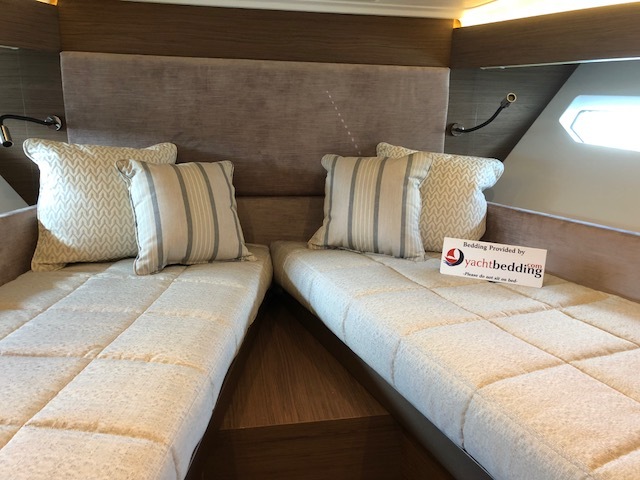 The designer has used top class materials like titanium and leather and also lacquer finishes to enhance the staterooms that takes the beauty of this boat to a whole new level. Our designer, keeping in view, the stylish theme of the boat, came up with this bedding. Box quilting in a neutral tone that truly complements the sleek modern line of the boat. our quilted coverlets are made custom with column or box quilting and piping trim edge. They are designed to fit the size of your bed and very easy to put on. Who doesn’t want a bedding that is super easy to make the bed and at the same time, gives a clean, crisp look to your bed. This is the reason we always recommend our coverlets to our customers available in a variety of fabrics with interesting textures and patterns. 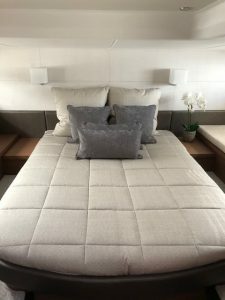 The image of this GT 46 stateroom says it all. Neutral combination of colors, clean lines and soft textures goes perfectly well with the contemporary interior of this yacht. As we talk about coverlets, let me mention my favorite, the Interlaken Matelassé coverlet mainly used as blanket by most of our clients. Interlaken coverlet strikes a beautiful balance between modern chic and effortlessly casual for a well-dressed bed. Everyday cotton takes on a rich, textured appeal with the Interlaken matelassé coverlet. Distinct with a stacked geometric pattern delivering warm appeal to transitional bedrooms. And not to forget the light weight, easy-care cotton Diamond Matelassé coverlet. This classic coverlet features a diamond pattern texture, and its cotton construction provides maximum comfort, beautifully made to fit your custom boat mattress. Both of these available in a whole ray of colors for you to choose from. We specialize in making your bedding custom and always use the best quality fabric and texture to provide complete satisfaction to our client. Feel free to contact us any time and we can transform your stateroom in your dream theme in no time.